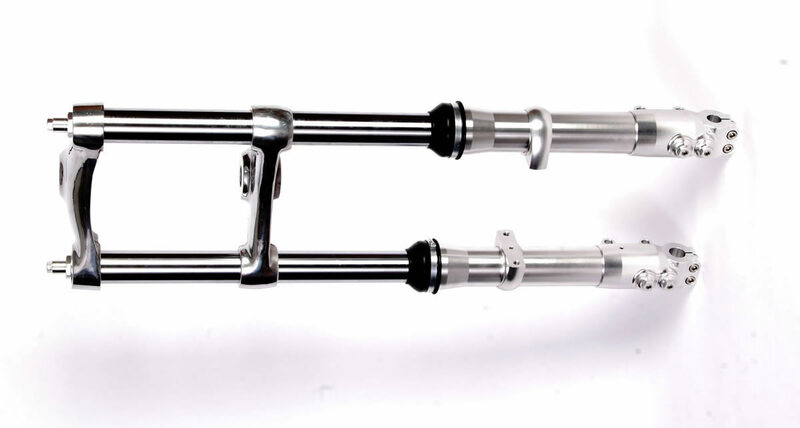 This is an exact replica of the famous Ceriani GP35 racing forks. The legs are made from 6061 aluminium, mounted with CNC machined fittings, the stanchions are from CR-MO tubes, hard chromed. Optional aluminium triple clamps with 180 mm center hole distance and 45 mm offset. To make a purchase use the form at the bottom of the page – More products: shocks, brakes, bars & levers, parts. Advanced racing replica of the GP35 forks. Fully adjustable spring preload, compression and rebound damping. The GP35R forks and 180mm brake plates I bought from you are fantastic, many people ask where they come from, so I have passed your email onto them. As same as GP35, but the bottom legs are fitted with bracklets for disc brake caliper. The price doesn't include the adapter between the bracklets and the caliper. I received my forks yesterday! They are beautiful ! Already have them on the bike. Thank you! It is a pleasure doing business with you. I will be going to a big flat track gathering in a few weeks and I'll be showing off my new forks. As same as GP35R, but the bottom legs are fitted with bracklets for disc brake caliper. The price doesn't include the adapter between the bracklets and the caliper. All who bought front fork to finland ask from me do I like, and I like. Its wery good! Thanks! As same as the GP35 front forks, but the main tube diameter is 38mm, more massive and resistant against damage. 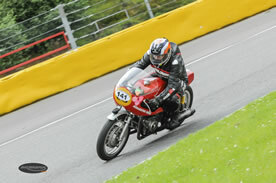 I have been using adjustable Ceriani forks for a year now on short circuits and during road racing as well. It is clear that I have to adjust suspension according to riding speed, characteristics of the circuit and quality of the road surface. With GP 35R Ceriani forks it is easy to get the right spring preload, the exact compression and rebound damping according to the particular race track. That way I am able to reach better laptimes safely and I enjoy racing much more.